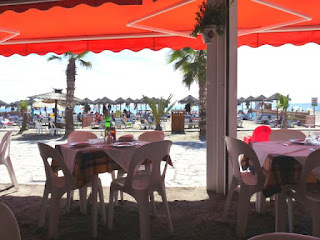 The Creative Cafe Project: Nerja –One Big Creative Café? We’ve been coming to Nerja now for 24 years. When we called at the bar just now to use the Wi Fi we met someone who started coming here 25 years ago and now lives here. He’s never met anyone who doesn’t like the place. I’ve met just one such person. We know lots of other people who keep on coming back. But in all the years I’ve been here I haven’t really found what I would call a Creative Café? Is it that it’s too hot to look? There is one bar near the Burriana Beach that encourages book crossing and one or two bars display local art for sale. That’s about it. Except, maybe not quite. There are those old men who used to sit in the shade of the lemon trees outside the market place, when it was a market place. They now put the world to rights a little further down the road outside a small local café, purchasing an occasional coffee. 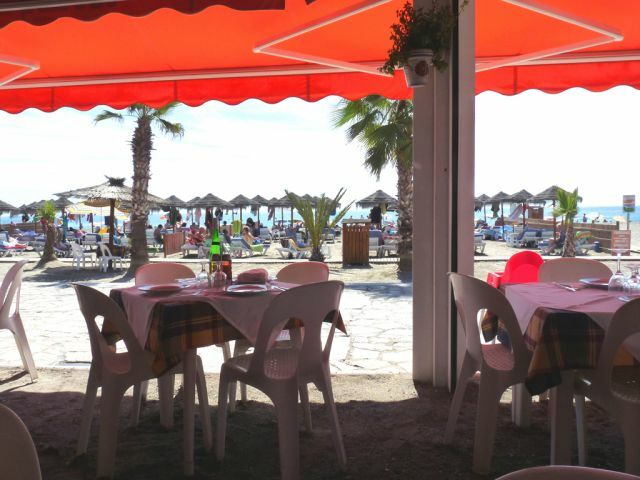 You can actually count all of the sunbed areas on the beach as cafés. The managers act also as waiters and fetch drinks and snacks from the merenderos behind. The sunbeds’ occupants read a variety of literature some far more literary and intellectual than one would imagine. Not to mention the conversations that go on amongst friends and between strangers. And there’s the odd strolling busker that these days are much better than they used to be 20 years ago. Yes, it’s all about sand, sea and sun. Yet it’s actually about more than just sun-bathing. There’s culture aplenty, anyway. Concerts in the caves. Exhibitions. Stage plays. Decent cinema. Much history. But not necessarily inside a café. I wouldn’t be a writer if I hadn’t come to Nerja 24 years ago. I’ve published a short story set here, written by someone else. I know of another children’s writer who spends each winter here. And yet another enthuses about it too. So, the creative practitioners abound. Maybe because of the microclimate here – cooler in summer and warmer in winter - they don’t need to hide within a café to connect with others in the way that the Creative Café permits. Or could it just be that Nerja is one big Creative Café? I couldn't believe it when I saw your post about the Burriana Beach. My husband and I first went to Nerja in 1976 for our honeymoon and now go back several times a year. It's a gem of a place!